High quality and innovative techniques are of utmost importance to feltmakers all over the world. 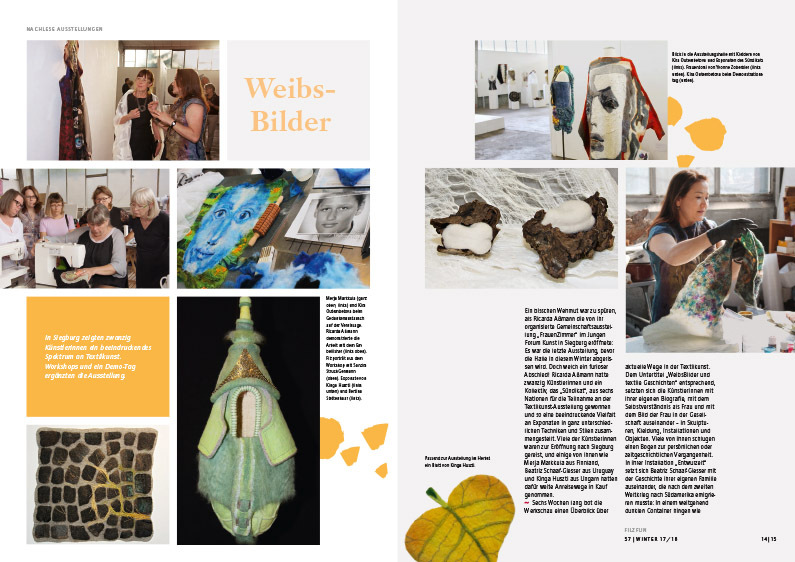 Due to that fact advanced education programs, workshops and courses given by internationally renowned felt artists here and abroad are much sought after – with astonishing results. 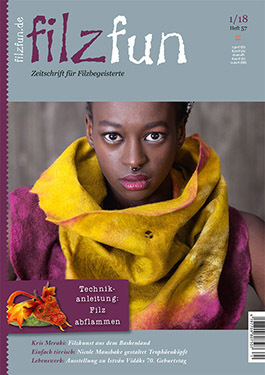 In the winter issue of the filzfun we are glad to report, among other themes, from the graduation shows of the Filzschule Oberrot and the Swiss feltmakers‘ scene, from the summer schools of the Filz-Netzwerk and the international advanced felt education program of the newly-founded Austrian association wollmodus, which we would like to present in detail. Exclusively for our readers we have visited a couple of trend-setting textile art shows, e.g. an exhibition in honor of István Vidák’s 70th birthday in Budapest and a joint exhibition called FrauenZimmer initiated by Ricarda Aßmann in Siegburg. 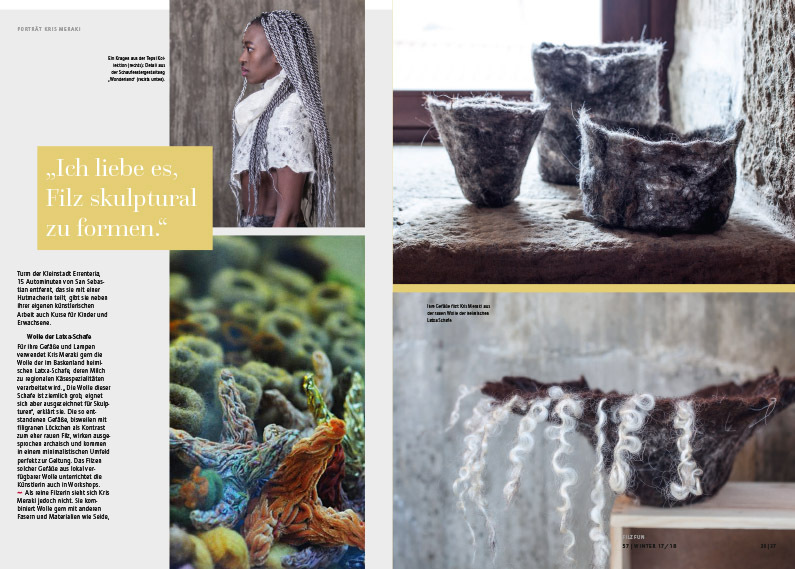 In our richly illustrated portraits we would like to present most diverse artistic personalities: The Basque lady Kris Meraki whose work is shown on the cover of the winter issue processes, a.o., the wool of the local Latxa sheep. Nicole Maushake enhances the wet-felted trophy heads she makes with lovingly chosen details and accessories. 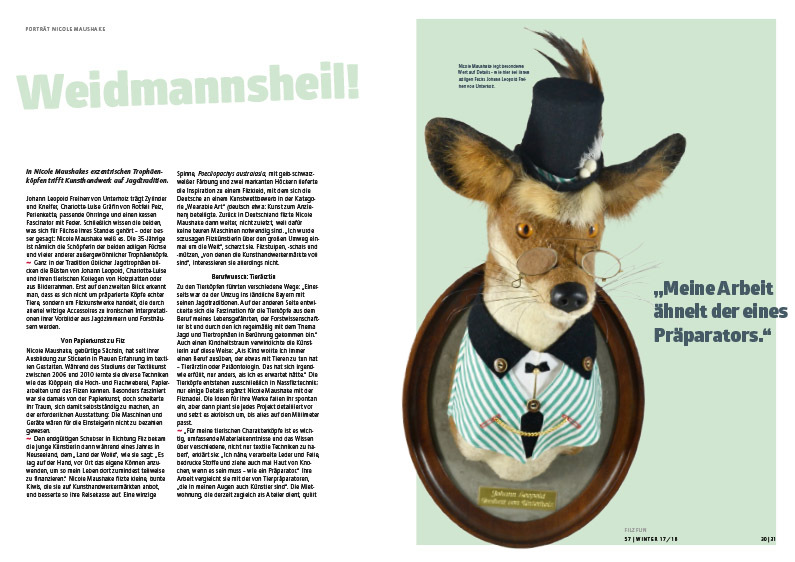 The scientist Merja Markkula only turned to the arts around the turn of the century. In her textile art objects she transposes her thoughts about the world and the essence of man. Gabriele Bernards again uses the craft for the welfare of others: She is highly committed to refugee aid and the protection of animals. 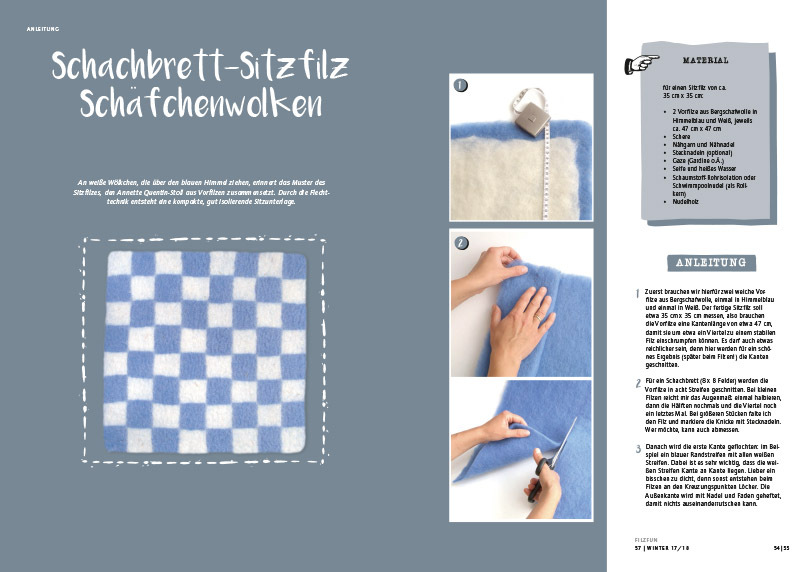 How out of a two-colored pre-felt a comfortable sitting pad with a chessboard pattern is made describes Annette Quentin-Stoll in her step-for-step instruction with many photos. 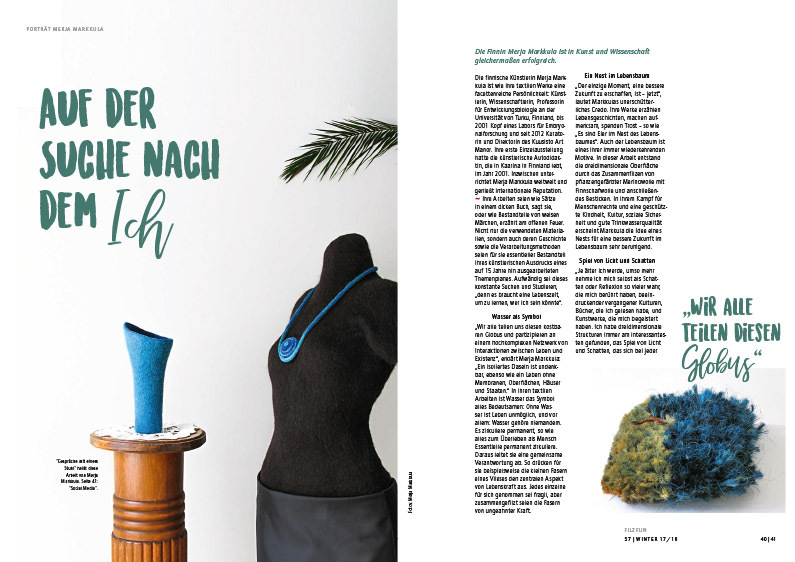 Felters that were rattled by outstanding, wiry little hair on the surface of their own felted objects should be prepared for a literally hot remedy tried out by Margit Röhm: The surface can be smoothed by removing the hair through singeing. 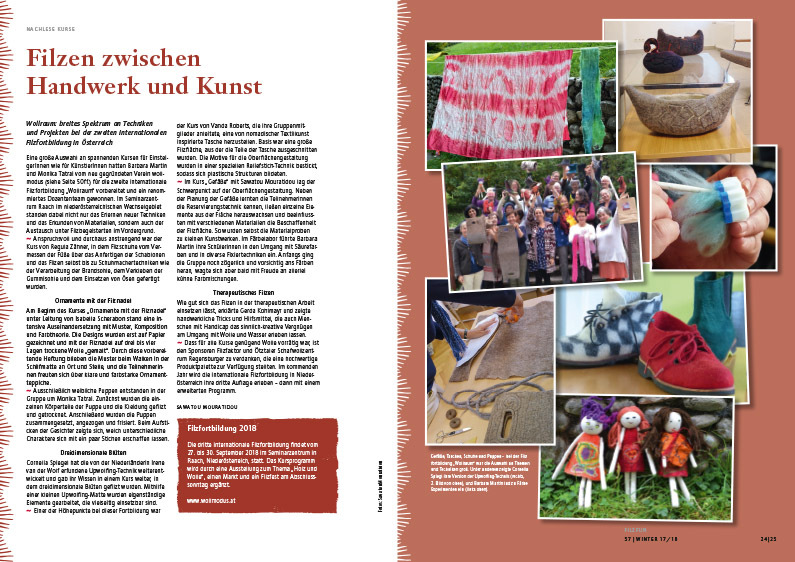 Apart from all that, you will gather plenty of information from the feltmakers‘ and textile art scene, for example of the action »Schaf des Monats« (Sheep of the Month), tenders and applications for competitions and a four-page attachment brimming over with dates and schedules for courses, exhibits, markets and other textile events. Nicole Maushake: Good Hunting Luck!